This is an excerpt from Land: A New Paradigm for a Thriving World, published by North Atlantic Books. Many of us have driven through the countryside and beheld the beauty of rolling hills and valleys, open prairies and rugged deserts, as well as admired the dazzling variety and intricacies of flora, fauna, and terrain. But unless we’re driving through a public park or nature preserve, most of the land we see is likely surrounded by barbed wire and “No Trespassing” signs. We’ve come to understand that all land not explicitly designated for public use is privately owned by individual people or groups, regardless of whether it’s put to use or not. Millions upon millions of privately owned acres contribute to an artificially created scarcity in a world of plenty. We collectively occupy far more land than we actually need, in anticipation of the future gains we might be able to extract as a result of the scarcity we ourselves have created. The next time you pass by a property that’s only minimally used but nonetheless owned, consider how harmless it seems. You might even think that the private ownership may have preserved a little piece of nature from human contact; otherwise, perhaps human beings would have frivolously inhabited it, just as we seem to inhabit any and all other lands that we find freely available. The destruction of nature is the direct result of a severely dysfunctional economic system, a system we have created ourselves over millennia. Without any doubt, we as a species are committing ongoing ecocide: the destruction of our own habitat. Nature can be—and, of course, already has been—altered to such an extent that various life-forms can no longer support themselves in certain areas. We’re already paying a steep price for the destruction of nature, measured not only in dollars but in the suffering of billions of human beings and other life-forms all over the world. This destruction has increasingly irreparable consequences; meanwhile, the root issues are not properly understood and are left unchecked. I would like to mention an interesting study led by biologist Anthony Barnosky, published in 2012 in the journal Nature. The authors of this study, twenty-two respected scientists from fields including zoology, paleontology, and ecology, note that local ecosystems generally undergo significant shifts once their decline crosses a certain threshold, which empirical data demonstrates to be anywhere from 50 to 90 percent of their original size. 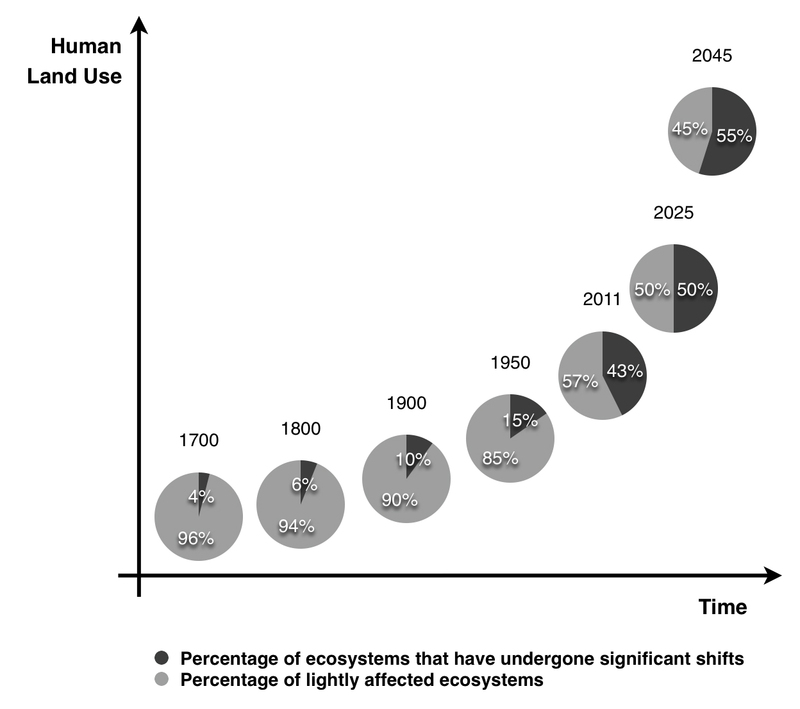 The authors propose that our global ecosystem might behave similarly. According to the study, humanity has already encroached upon 43 percent of the Earth’s ecosystem, as measured by our use of total habitable land; the authors conservatively estimate that we will hit the 50 percent mark no later than 2025. Anthony D. Barnosky et al. “Approaching a State Shift in Earth’s Biosphere,” Nature 486 (June 2012): 52–58.So far, we’ve learned that our hoarding of land creates a localized sense of scarcity. Because of this artificially created scarcity, human beings all over the Earth seek to supplement their meager incomes through the additional exploitation of nature—usually not for productive but for speculativepurposes. It doesn’t take too much imagination to realize that as long as people and institutions are allowed to profit from land at the expense of other people, we’re enabling a system that incentivizes the destruction of our own habitat. This happens in three primary ways. First, since human beings are allowed to profit not only from their goods and services but also from nature, we encourage the pillaging of nature to supplement incomes. Our incomes, however, are already relatively meager due to the unequal sharing of natural and social wealth. By allowing people to profit from land, we give them an incentive to harm their own communities through the reckless destruction of our planet’s delicate ecology. Second, because our ability to profit from land at the expense of our communities is firmly entrenched in our economic system, and because, as a result, existing land is priced far above its actual value while wages and capital returns are taxed, the cost of living is significantly higher for all members of society than it really should be. This high cost of living requires human beings to extend themselves and their economic activities far beyond levels actually necessary to support their ongoing existence. And since most economic activity heavily depends upon our extensive use of raw materials and generates enormous amounts of nonbiodegradable waste, any additional wasteful economic activity by default comes with a steep ecological price tag. And third, our current model of land ownership encourages a sprawl of human civilization as populations seek out land that’s still available at a lesser cost. For example, land that’s held speculatively and not put to productive use inside a city or a town is a major reason people live in suburban communities far from their places of employment, resulting in the kind of urban sprawl and suburban dystopia often seen throughout North America. 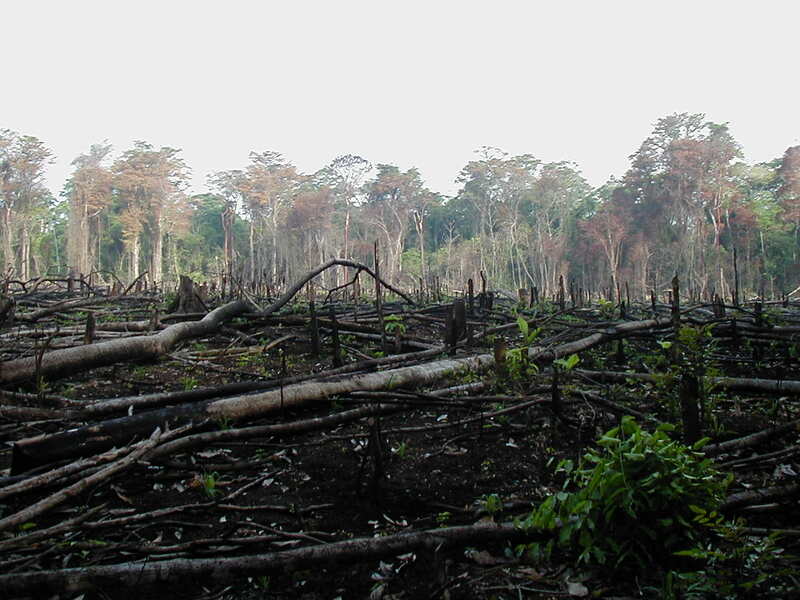 This very mechanism is also responsible for the destruction of rainforests. In the areas where rainforest destruction is epidemic, wealth inequality and land ownership rates are particularly disproportionate; millions of acres of prime farmland are owned by only a few and are used mostly for grazing instead of farming purposes. 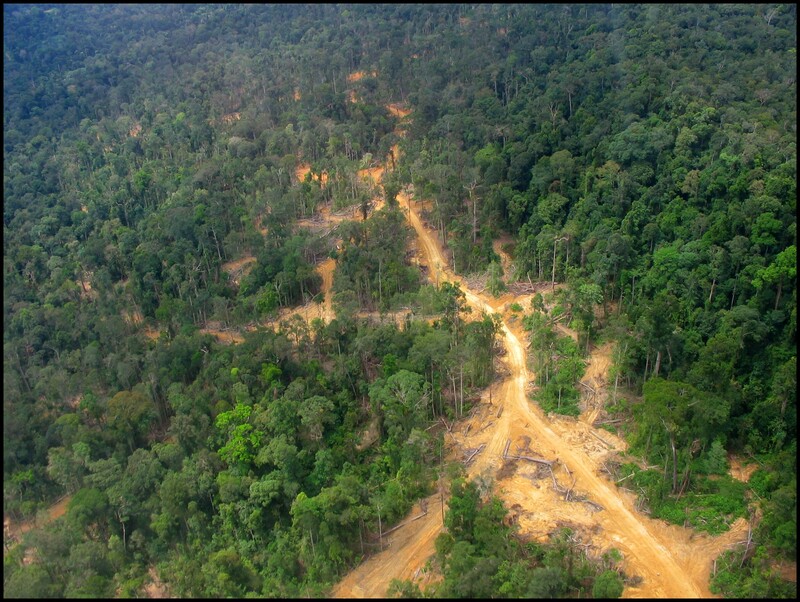 This status quo naturally forces many to slash and burn large areas of the rainforest in their quest to obtain land just so that they can simply make a living for themselves. In 2007, a team of researchers from McGill University of Montréal, Québec, Canada, published a study that correlated heightened levels of wealth inequality to increased biodiversity loss. The results were so astounding that the study was repeated in 2009, but with more complex models, to similar results. The researchers discovered that a nation’s economic footprintprovides a close enough correlation to be statistically significant, particularly if taken together with its level of income inequality. A nation’s economic footprint is the size of its economy relative to its geographical size, that is, relative to the size of its land mass. The fact that a nation’s economic footprint provides significant correlation to biodiversity loss should come as no surprise; if a nation’s economy is large compared with its amount of land, land will increasingly be hoarded, and this hoarding will invariably have a significant impact upon the ecology. This dynamic is particularly interesting if we consider that the income inequality factor provides us with an additional correlation, and income inequality, as we know, can be traced back to the hoarding of land. In their biodiversity study, the researchers mentioned another study that highlighted the unequal sharing of nature as a potential cause of both wealth inequality and loss of biodiversity: “A study of community forestry in Mexico showed that village forest management was correlated with levels of inequality. In a village with an economic structure that was highly unequal, forests were managed poorly because small groups of powerful people manipulated the logging industry for their own benefit, resulting in overexploitation. In more equitable villages, however, community institutions were more effective, resulting in better forest management and likely less biodiversity loss.” Could it be that whenever nature is hoarded we’ll see greater wealth inequality and biodiversity loss? Common sense on its own points to a correlation between our profiting from nature and the loss of biodiversity. © Text Copyright Martin Adams rights reserved.